Learner’s Edge® DigestRight®10 / 90 caps - Nature's Way®. Take 1 or 2 capsules with each meal or snack, or as recommended by your healthcare professional. If desired, capsules may be opened and contents mixed into a small quantity of cold food. Consume immediately and follow with untreated food. DigestRight® is a registered trademark of Creations Own, Inc., which is licensed for use to the International Child Development Resource Center (ICDRC) and Integrative Therapeutics, LLC. 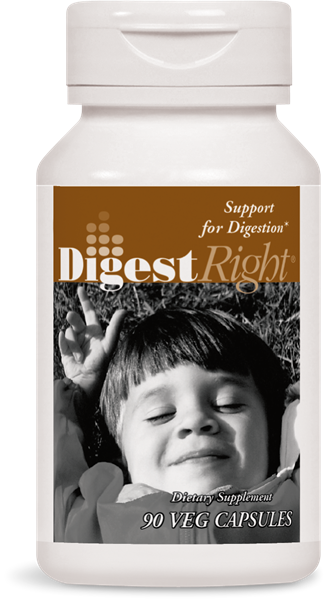 DigestRight is a comprehensive microbially-based enzyme supplement for children. DigestRight promotes optimal digestion of a full range of foods. * The enzymes in DigestRight are acid-stable and can survive exposure to stomach acidity without the need for an enteric coating. Why is DPP IV activity important? At what age can DigestRight® be taken? The Learner's Edge® line of products was developed to meet the nutritional needs of school-aged children (five years of age or older). * We encourage parents interested in giving this product to younger children to discuss it with the child's healthcare professional prior to use. Are any ingredients in DigestRight® derived from nuts? No, none of the ingredients in DigestRight are derived from nuts. By law, dietary supplement manufacturers must clearly list any and all ingredients obtained from peanuts and tree nuts, as well as the other Top 8 Allergens. Are there any drug or nutrient interactions with DigestRight? Caution should be taken whenever recommending, or consuming, nutritional supplements. Healthcare professionals can use this drug-nutrient interaction checker to view potential interactions with the ingredients of DigestRight. Patients should consult their preferred healthcare professional for any supplement questions. Do not chew capsules. Do not use if gastritis, peptic ulcer or heartburn is present. When mixing capsule contents in foods, avoid contact with eyes and inhalation of powder. Changes in food consistency may occur when mixed with capsule contents.